This contemporary power reclining sofa will make a great addition to your home furniture collection. 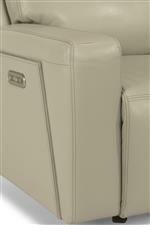 This piece features fully-padded footrests, back supporting backrests and plush headrest for comfort from head to toe. Equipped with a smooth power reclining mechanism, this sofa allows you to adjust to any position at just the touch of a button. The headrests can also be adjusted via power control allowing you to find the most supportive position possible. You'll find two USB ports installed on each power control for keeping your devices charged while you relax at your home. This sofa requires 4" of wall clearance. The Latitudes-Niko Contemporary Power Reclining Sofa with Power Headrests and USB Ports by Flexsteel at Conlin's Furniture in the Montana, North Dakota, South Dakota, Minnesota, and Wyoming area. Product availability may vary. Contact us for the most current availability on this product. Combining comfort and contemporary style, this collection offers a fresh and functional update for your home. 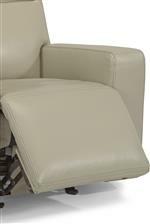 Each piece in this collection is equipped with power reclining mechanisms that allow you to adjust to any position while adjusting the headrest position independently for a completely customized experience. This collections provides support from head to toe with a fully-padded footrest, divided back cushion and plush headrest. 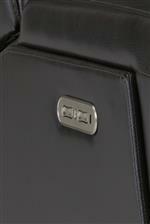 To top it all off, you'll find two USB ports installed on the power controls for your technology needs. The Latitudes-Niko collection is a great option if you are looking for Contemporary furniture in the Montana, North Dakota, South Dakota, Minnesota, and Wyoming area. Browse other items in the Latitudes-Niko collection from Conlin's Furniture in the Montana, North Dakota, South Dakota, Minnesota, and Wyoming area.